Resting on a hand after being knocked loose from Lycium fremontii. Palo Verde, Maricopa Co., Arizona. Feb. 2nd, 2014. Length is about 2 mm. 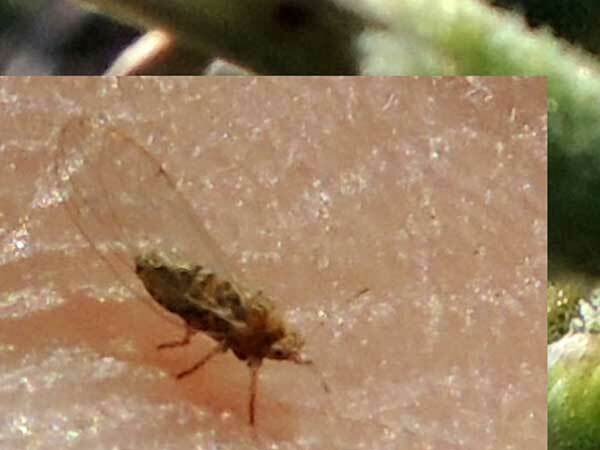 Many, if not most, of the key organisms that make up the intricate web of life in the Sonoran Desert are as small or smaller than the minute psyllid pictured here. This is certainly true if we include the mites, nematodes and bacteria. Huge numbers of these jummping plant lice, as psyllids are sometimes called, inhabited every Fremont Thornbush at a spot in western Maricopa County, Arizona. Thousands upon every bush busily sucking sap and reproducing yet more psyllids. Yet the plants appeared healthy and were flowering profusely. Tapping the stems lightly causes the bugs to fall out. Thornbushes (Lycium) are members of the Solanaceae, the same family as the white potato. Psyllids, like many insects, tend to feed on a narrow taxonomic range of plants. These same insects can sometimes grow and reproduce on potatoes and transmit diseases as well. Copyright Michael J. Plagens, page created 5 February 2014.